The work of Béla Balázs (1884-1994) belongs to the classical film theory period, a period which came to an end around the mid-1960s. The two most prominent figures of classical film theory are Siegfried Kracauer (1889-1966) and André Bazin (1918-1958), whose works have not only overshadowed those of Balázs’, but also generally been better understood by the intellectual and film-going public. In the English speaking world, one major reason Balázs’ works have been sidelined is because, up until recently, Anglophone readers have only had access to English-language editions of Balázs’ last film theory book FilmKultúra, Theory of the Film (1952) and to extracts from some of his earlier books and essays published in journals such as Screen. However, these publications have only provided partial insights into Balázs’ film philosophy. Béla Balázs: Early Film Theory helps the English speaking reader become better acquainted with Balázs’ oeuvre. It publishes in full for the first time in English both Der sichtbare Mensch (The Visible Man) (1924)—Balázs’ first film theory book – and Der Geist des Films (The Spirit of Film) (1930). Balázs was born in Hungary in 1884. While he started to establish his literary career in the 1910s as a poet, playwright, and librettist it was not until 1922 that he started writing on film, publishing film reviews for the Vienna daily Der Tag. Two years later he would release the first film theory book ever written in German—Der sichtbare Mensch. In this book he started to sketch out his ideas on the aesthetic and cultural position of cinema vis-à-vis the ‘traditional’ arts such as theatre, literature, and painting. 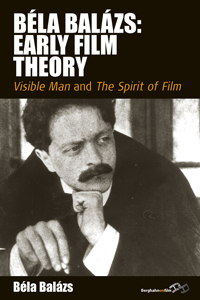 In Béla Balázs: Early Film Theory there is an informative introduction by Erica Carter. This introduction situates Der sichtbare Mensch and Der Geist des Films in the different cultural and intellectual perspectives that, in the early twentieth-century, were influencing Balázs. Carter suggests that Balázs was shaped by a romantic utopianism that was informed by both his interest in Hungarian folklore and by his commitment to revolutionary and liberal ideas in the modern avant-garde movement of his time. She also says that he was part of a Central European Jewish community, moving with the Marxist philosopher and literary critic Georg Lukács (1885-1971) in various educated, Jewish circles. One of these was the Frankfurt circle whose members included Kracauer and the critical, social theorist Eric Fromm (1900-1980). Balázs’ film theory evolved out of this combination of perspectives that he was exposed to. Balázs is often considered the man of silent cinema, physiognomy and the close-up. While these are key topics of his film philosophy, it has not always been understood what physiognomy means in the context of Balázs work. Moreover, rarely has full appreciation been given to the fact that Balázs also addressed sound cinema and reflected on its potential to be art. Carter’s introduction explains the nuanced meanings behind Balázs’ notion of physiognomy and why he held out utopian aspirations for both it and techniques such as the close-up (techniques which along with other elements such as editing and sound were for Balázs all part of film’s physiognomy). This tension, however, should not necessarily be seen as a negative. Balázs’ books are forerunners. They appeared during a time when the moving image was still first emerging and when rapid changes were occurring in industrial production, cultural lifestyle, and art. In this period of cosmopolitan modernity, the moving image was striving to obtain the status of art while at the same reflecting on its own unique properties of industrial and technical production as well as mass exhibition that did not necessarily complement the established, fine arts. The reader should keep in mind this wider context and remember that Balázs’ books still represent some of the earliest and finest attempts to define and formulate the then infant medium of cinema. Béla Balázs: Early Film Theory is published by Berghahn Books and part of the Film Europa: German Cinema in an International Context series. The book has an attractive typeface and a well-designed layout. In addition to Carter’s introduction there is also a useful Glossary of terms and an Appendix with two reviews of Der Geist des Films, one by Kracauer and another by the art and early film theorist Rudolf Arnheim (1904-2007). In all, this book is a very good introduction to Balázs’ film philosophy and a long overdue entry into the English-speaking world of film literature.